ETA: Campaign is over! And we gave 110%! I mean literally, the final take is 110% of the goal. There will be a generic “reserve a copy of the book” button around here soonish, for people who missed the Kickstarter but want the paperback. Watch this space. Look at this beautiful book. Who wouldn’t want to get their hands on that? I’m too tired to come up with a witty closing statement here. I just promise it’s gonna be a fun, funny, pretty book, and you will enjoy having it on your shelves. To help you start planning your requests ahead of time, I’ve compiled all the options for webcomics and their characters. Pick from your long-time favorites, or take the opportunity to fall in love with something new!Continue reading All the webcomic fandoms in #Yuletide 2018! 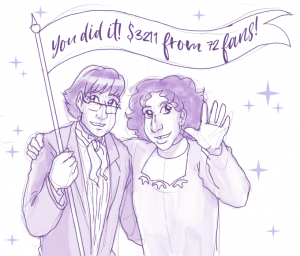 Good news: Leif & Thorn is accepting guest strips again! I didn’t get enough to fill a week in March, but I did get a few…and those will definitely be posted at the end of October. It’ll be a nice breather after the ends of the Volume I Kickstarter and the six-month (!!) Leachtric storyline. I’d love to stretch out that break by adding a few more strips to the ones I’ve been saving. So if you have a great Leif & Thorn bonus idea, now’s the time! Submissions will be open until September 30. You can use any AU, explore any era, include any headcanons. When you submit the strip, include whatever name you want to be credited by. And, if you like, a link to your gallery/blog/fanfiction account/webcomic/Etsy store. Safest way to get the strips to me is by email (sailorptah at gmail dot com). You can also PM me on Deviantart, or submit them via Tumblr. First, the favor: Anyone have a recent version of Photoshop (at least CS4, ideally later) who would be willing to make some Leif & Thorn graphics for me? I have the art, I have the template…but the template has Smart Objects, and all I have is CS2, which is not smart enough. Shoot me an email (sailorptah at yahoo dot com) with “Photoshop Graphics help offer” in the subject line, and I’ll send you the source art to put together! Next, a question about pins. In the form of a poll, because the people, they love polls. Which Leif & Thorn character(s) would you want on a pin? All the cute animals! Pink Spotted Owlgull!!! In the process of planning the Leif & Thorn Volume 1 Kickstarter, I’m starting an email list for announcements and updates. Because as much as it helps to be on Twitter and Tumblr and Facebook and so on…the first thing most people check in the morning is their email. Obviously things will get posted on the website too — but maybe you don’t check the site every day. 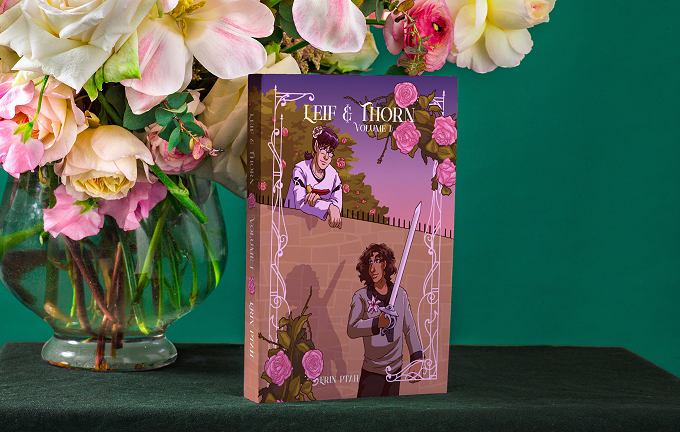 Or maybe you want the latest Leif & Thorn (and But I’m A Cat Person) news delivered straight to your inbox with no delay. Well, this is for you! I don’t actually like cold-sending emails, so I can promise you won’t get spammed with random trivia. Just the big updates, like book releases and Kickstarter kickoffs. 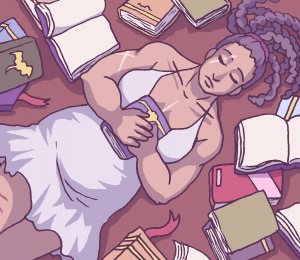 New polls: How many webcomics do you read? + How do you follow this comic? New polls: How many webcomics do you read? + How do you follow this comic? published on 13 August, 2018 Read more posts by the author of New polls: How many webcomics do you read? 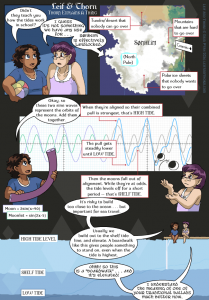 + How do you follow this comic?, Erin Ptah10 Comments on New polls: How many webcomics do you read? + How do you follow this comic? If you scroll down to read the comments on any strip, you might notice there’s now a polling widget underneath! It randomly cycles through all our active polls. Right now that means (a) the shipping poll from the previous post and (b) the two you can find right here. Shoutout to the Comic Tea Party indie-comic reader-habits survey, which got me thinking about all the cool data I might want to track. 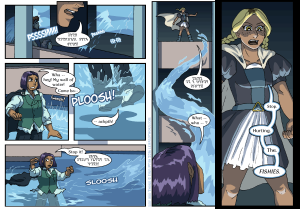 How many ongoing webcomics do you keep up with? How do you follow Leif & Thorn? I have all the webcomics I follow bookmarked in folders by day of the week they update, and check them daily. So L&T is in all of the folders, one for every day of the week, and gets checked daily. I constantly keep the tab open. This particular poll widget allows the website admin to mess with almost anything through the back end. So if any user abuses this to add a troll answer, it can be deleted. Check it out, the site has polls now! Check it out, the site has polls now! published on 1 August, 2018 Read more posts by the author of Check it out, the site has polls now!, Erin PtahNo Comments on Check it out, the site has polls now! Some topics that are more about dealing with practical Life Concerns, outside of the art itself. Lots of influences, sure — discussed more on the inspiration post — but they’re all artists (comics, illustrators, writers) rather than educators. Favorite story-writing influences: L. Frank Baum, Octavia Butler. For comedy-writing specifically, Stephen Colbert. Visual-art-wise, Alphonse Mucha. Comic creators that I’ve gotten the most from: Naoko Takeuchi, Kohta Hirano. I’ve gone to a bunch of local figure-drawing sessions (most of the results are NSFW) not affiliated with any school or class. Those can be great. Went to an art high school, buuuut I was there for the literature program. Did get into one of the art courses — as a junior without the full background of the art-track juniors, I got placed with a sophomore class. Like…c’mon, I was/am a huge anime nerd, but I did know that wasn’t the point of the class. The value of an actual art degree is so unreliable that it’s a punchline, but I do wish I’d taken more art classes in college. My BS degrees have been, uh, of limited use, and at least the art would’ve been fun. 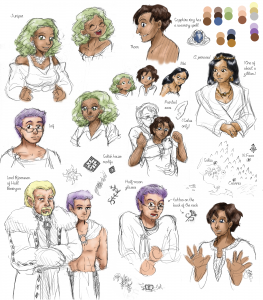 See Resources for Making Webcomics! I avoid Pinterest because of its reputation for being bad at sourcing, and for making it hard to find an artist’s original post. At least on Deviantart, and sometimes on Tumblr, you usually get tutorials posted by the artist who made them. Slice-of-life is about fictional characters, autobio is about yourself (and might not actually fall under slice-of-life, depending on how exciting your life is). I run out of interesting autobio material pretty quickly. It’s why Webcomic Woes doesn’t have a fixed update schedule, so I can draw it based on when something funny happens. Recommend each other’s work, draw fanart, do exchanges, share advice & resources, support each other’s Kickstarters and Patreons when possible, follow on blogs & social media, promote with likes & reblogs. “Be excellent to each other” is always a good star to steer by. Personally, I make a bunch of stock backgrounds & repeating tiled patterns that are free to use. And I have a standing offer to do guest-art swaps with other webcomic artists! 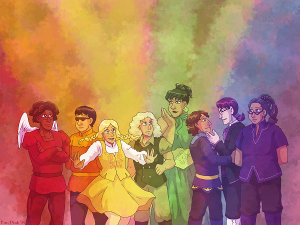 If you want some cross-promotional energy with an audience that’s into LGBTQ+ fantasy/comedy, hit me up. Con stuff. I really wish I had a con buddy – either someone full of experience who can give lots of advice, or just someone I could split the cost of a table with and look out for each other’s merchandise while the other makes a bathroom run. In the meantime, I do a fair amount of looking up other people’s “how I did this cool thing” tutorials, or “the brushes I use for this effect” freebies. Seems like I was the only person on Twitter who’s never gotten “please read my comic, here’s an unsolicited link” spam. Even when I’m actually doing rec posts, I barely get solicited links. Most of the spam I get is on my websites, but WordPress filters it so effectively that I never have to deal with 99.9% of it. As a result, most of the spam I encounter is via email. …really, I’m mostly adding this here so you get a link to some choice excerpts from my Akismet spam filter. Start with a single strong/exaggerated personality trait, and build outward. You want a memorable hook for readers, especially with minor characters who may not appear for months at a time. I had fun writing the Leachtric sections of Leif & Thorn because it’s a show-within-a-show. 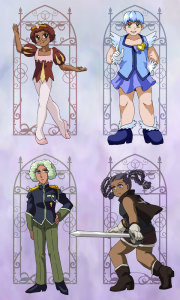 I got to develop the characters as they existed in-universe, then figure out how they’d be fictionalized for a historical drama. I’m a discovery writer. Can’t plan too far ahead in too much detail, because I’m always working out new things along the way. That applies to character actions as much as anything else. For instance — there are plot points that were conceived with a vague idea of revealing them in But I’m A Cat Person‘s climax, but instead they’ve already happened, because there was no good reason for the characters to keep holding the information back. Well, most characters are going to have a little bit of the author in them somewhere. …there was one time, many moons ago, when I left a comment on another person’s work that effectively said “character X needs to get a clue and realize they’re bi.” Author reacted with fury, because character X’s experiences were based on their own, and they were straight, definitely straight, how very dare I. Six months later, this same author was bi, definitely bi, and proud of it! …but still mad at me. Never did quite figure that one out. Some things are easier/more effective/more fun to express via storytelling than anything else. If you develop a character enough to really understand their perspective and motivations, you usually can’t end up hating them. Unless they’re a particular flavor of villain. If this is talking about when you hate the process of writing a certain character…why would you keep it up? Unless it’s work-for-hire, there’s absolutely no reason for it. In terms of the content: Sailor Moon and Hellsing. In terms of the mechanics: the moment I realized “posting comics on the Internet and having people read them” was a thing, it was like a light had been switched on. First read might’ve been Venus Envy. Sometimes readers pick up on inspiration that isn’t in the order they think it is. Like the person who asked if a plot point in Leif & Thorn was inspired by Steven Universe. Nope — both it and SU are doing the same reference to Utena. I’ve also been inspired by things in the news, particularly disasters, which means I end up researching them and learning a lot about the real-world background. 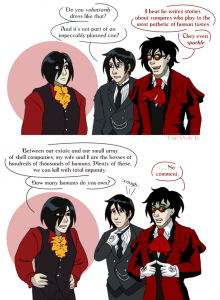 Even when the in-universe considerations are different (mostly because they can have magic-based solutions). Hey, I was just listening to a DoL epsiode that goes into this. It’s easy to spot a magical-girl series where the creator’s only inspiration is Sailor Moon. People who have watched/read a bunch of different mahou shoujo come up with fresher, more grounded, more engaging additions to the genre. Terry Pratchett is the model for doing this right, imo. Discworld riffs on everything — this book is Phantom of the Opera, that one is Macbeth, this one has a whole sequence that’s Mad Max, and so on. But it’s all set in a fundamentally well-developed world. The characters have rich and complex personalities. There’s a lot happening on the Disc besides direct takeoffs on other stories. The writing is funny and thoughtful. …also, he makes the most extended references to public-domain works, which I’m sure helps. At this point? To start something new, it has to be powerful enough on its own that I’m inspired with no extra effort. Otherwise, it’ll take away from the seeking-out-inspiration energy I’m already using on existing comics. Also, doodles! Get a feel for the characters, the props, the setting — and discover which bits you really like, and want to draw more of. Since BICP takes place in present-day Boston (…well, 2010 Boston, which was present-day at the time), I took a bunch of my own reference photos. Here are some of the settings from the early chapters. But I can’t think of any resources for “new projects” that aren’t just resources for…projects. 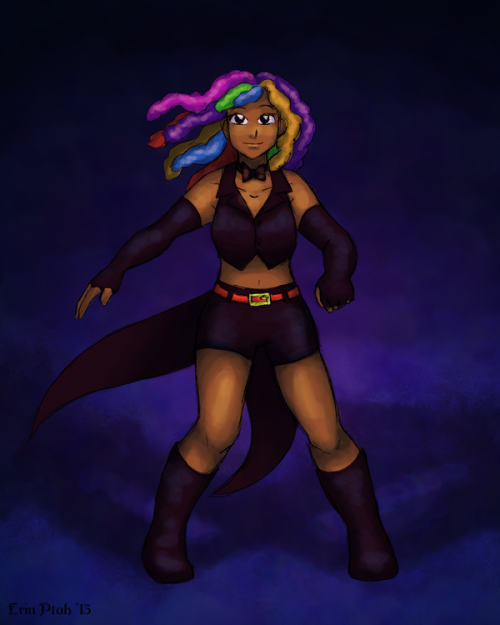 Everything from worldbuilding to fashion design is gonna be an ongoing endeavor. I’d been stuck on a while for this Leif & Thorn mini-arc, with some bonding and friendship-building for the goth kids. I had all the plot points, but something was missing – it was coming out like an As You Know Bob speech instead of a character moment. Then last week I wandered into this little Satanist/metal gift shop, and finally I realized, duh, the kids could be shopping here. So that’s the most recent thing I finished. Goth kids having character development while poking at all the skulls/etc that I got to poke at IRL.